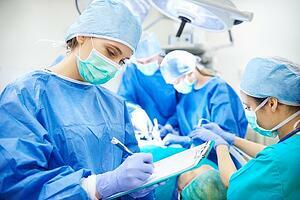 With patient health at stake, it’s imperative that surgeons learn strong leadership skills. But what does effective leadership actually look like? Depending on who’s steering the boat, the personality style of a leader greatly impacts team efficiency and patient outcomes. A study presented by the Journal of the American College of Surgeons identified two types of leadership styles in the OR: transactional and transformational. Below, we’ll look more closely at which one is most effective when leading your OR team. Transactional leadership, or “task-oriented” leadership, is probably the most familiar style of leadership. Transactional leaders tell group members what to do and when to do it. They take charge of group organization, establish a clear chain of command, and motivate team members through reward and punishment strategies. Transactional leadership is more managerial in approach. Businesses and athletics often rely on transactional leadership to achieve success in the corporate world or on the field. While this style may be good for scoring touchdowns or closing a deal, it has some definite drawbacks in the OR. Communication often suffers under transactional leadership because it encourages people to follow a strict set of rules and directives. Transactional leaders can be harder to question or challenge, which discourages OR team members from speaking up if they have a suggestion or notice a problem. Team members are also expected to stay in their lane, decreasing their flexibility and creativity when it comes to solving problems. These failures in communication can lead to an increase in surgical errors and flow disruption. A report by SIMAD University defines transformational leadership as “the ability to motivate and to encourage intellectual stimulation through inspiration.” The leadership qualities of a transformational leader include leading by vision and example, valuing individual input and relationships, and setting high standards within collective goals. In the BMC Nursing study, researchers found that supervisor support was a key characteristic of transformational leadership that positively correlated with increased job satisfaction. Transformational leadership may be extremely effective in the OR because it encourages communication and information-sharing in a controlled environment. Team members who work with a transformational leader tend to speak up more because they know their opinions are valued. The results of the JACS study found communication increased by 2 times and information-sharing increased by 5.4 times for every 1 point increase in a surgeon’s transformational leadership score. Justin A. Maykel, MD, suggests that the traditional “aristocratic, domineering surgeon” has been replaced by one who sets patient-centered goals shared with all team members. Effective leadership will ultimately affect patient health for the better. Good leaders will work to understand how their leadership style impacts their OR team, and how it can cause them to sink, remain stagnant, or sail the turbulent surgery seas with confidence.